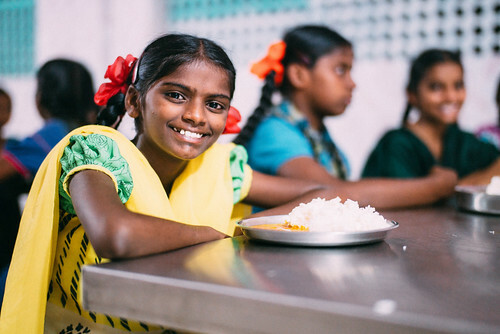 Photo: Orphans at our girls and boys homes are thankful for nutritious meals made with fresh, organic ingredients grown on our local farmland enterprise. February 24, 2017. We are happy to report that we harvested over 9 tons of rice this month at our rice farm. This harvest amount will provide a nourishing ingredient to our children’s meals for 4 months, realizing a savings of about $6,000 we would have spent to buy the same amount of rice in the market. Though our rice farm covers 5 acres of land, we were only able to cultivate 4 acres of rice due to a lack of rain this season. However, it was still a successful harvest, and we are thankful since rice is a great source of sustainability in India. The average Indian consumes about 14 lbs. of rice monthly, or about half a pound of rice a day, and the children at our Hope Center and at our orphan homes consume close to 18,000 lbs. of rice in their diets annually. The rice has to dry after harvest for 2 months, so we will start consuming the rice in April. Rice combined with lentils, another staple in the Indian diet, offers a nutritious source of complete protein, fiber, iron, and other essential minerals as well as Thiamin, Riboflavin, Niacin, vitamin B6, and Pantothenic Acid. In other good news, thanks to your support, next week we will be able to finalize the purchase of 1.32 acres of land adjacent to our main campus where we will build an athletic field and a locker room, which are both requirements for our new high school to gain accreditation. These new acres will triple our existing land area on the main campus, so our other plan for this bountiful space is to grow a vegetable garden, which will expand our existing on-campus ground level gardens and rooftop box gardens. The land expansion will allow us to officially open the school for tuition-paying day students since there is not a local high school in the area, while also allowing our own resident high school students to stay on campus vs. being bussed off campus. Both the vegetable garden and high school will contribute toward our goals for sustainability in our India programs. Our high school will also greatly benefit the girls in rural India, who rarely have the opportunity to attend upper level academic classes and graduate. If these girls do not receive a higher education, they are likely to be enslaved in child labor in the fields, or forced into arranged marriages at very young ages. But if these girls attend our high school, we will give them awareness about the rights of girls and women in their society in the hopes of protecting them from the dangerous situations that some Indian women live through. We will give them a quality education including computer instruction and useful skills such as sewing, thus equipping them with the ability to find good work and support themselves after they graduate. Our high school will encourage the girls immensely, giving them great hope for their future and safety.